Organizations across the industries are looking to leverage Human Capital Management (HCM) solutions to transform their HR, payroll, and talent management. This has been largely driven by the need to stay competitive in the ever-tightening labor markets. However, when selecting a new HCM system, one of the most critical decisions you will make is whether to go with cloud-based HCM or on-premise HCM solution. On-premise HCM is installed locally and generally requires recurring fees for support, training and updates. On the other hand, cloud-based HCM incorporates new approaches and best practices that help improve the management and empowerment of employees. Cloud-based HCM solutions not only require shorter implementation time but also ensure improved reliability and cost optimization. Cloud-based HCM solutions provide secure access to personal HR data through mobile or desktop devices. Users can virtually access employee records, health benefit information, vacation requests and payroll information anytime, anywhere – through a self-service portal - leading to enhanced employee engagement and job satisfaction. Cloud-based HCM can be updated automatically. This frees your IT staff from the labor-intensive process of internally upgrading systems. In addition, they use fewer physical resources and can be easily managed by shared IT resources. This helps significantly reduce maintenance cost. As the HCM solution is hosted in the cloud, it also eliminates the expenditure associated with building server infrastructure. Instead of replacing existing on-premise HCM applications, HCM in the cloud lets you take a hybrid approach by migrating some of your HCM applications such as talent and sourcing to the cloud, while maintaining core HR activities on-premises. The powerful pre-integration capability helps seamlessly connect cloud and on-premise applications, helping automate the entire onboarding process and accelerating time to productivity for new hires. A HCM cloud solution such as Oracle HCM Cloud helps manage workforce trends, and create competitive advantage with powerful reporting and deeper workforce insights. With a HCM cloud solution, businesses can take advantage of big data analytics and assessment results to optimize hiring, as well as examine potential career paths and development opportunities for candidates. 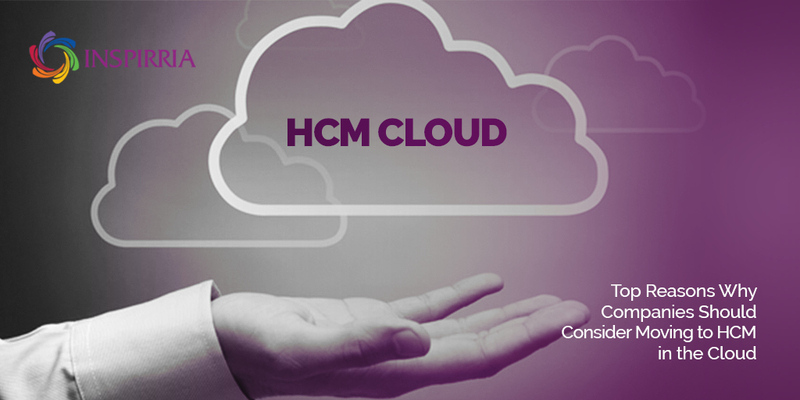 Most HCM cloud solutions come with plug-and-play HR tools that help simplify HR functions. In addition, HR teams do not require training in multiple software tools to be effective at their jobs. The plug-and-play HR tools of HCM in the cloud shorten the learning curve while helping HR teams to focus on their priorities. According to a report, 41% of HR teams are actively creating mobile apps to deliver HR services and 33% are using some form of artificial intelligence (AI) technology to produce HR solutions. This is helping them modernize HR processes, a critical factor for success. The right HCM cloud solution can help companies leverage the right digital and mobile tools to provide flexibility and agility to today’s digital workforce. In addition, a single cloud-based solution for HCM reduces chances of human errors, eliminates siloed information, and fosters organization-wide collaboration, powering superior outcomes such as reduced administrative overhead and increased productivity. Inspirria Cloudtech is a leading global cloud aggregator. We leverage cutting-edge expertise and more than 14 years of experience in cloud technologies to help companies deploy Oracle HCM cloud platform, thereby helping them boost employee engagement and transform their businesses. What’s In Store For Manufacturers In NetSuite Release 2019.1? NetSuite OneWorld - A financial platform for businesses for efficiency and profits. Why 'Built for NetSuite Badge' is Important? Why Businesses are Moving Their ERP to the Cloud and How It May Help in The Long Run? Why are Organizations Still Reluctant to Move to the Cloud and What It Costs Them? Are Organizations Suffering from Too Many Systems to Manage Their Business? How is Cloud Based ERP better than Legacy ERP? Why Do Organizations Buy Cloud ERP? Why Modern ERP Cloud is Key for Your Success? Are CIO's responsible for more than keeping the Lights on with Cloud Adoption? Why Fast-Growing and Start-Up Companies are selecting the Cloud for Financial and Accounting Software? Is The ERP That You Are Using Capable Of Growing You? How Can The CFO’s Reap Benefits From ERP Systems?